News International yesterday completed the sale of its Wapping plant, scene of the bloody strike that destroyed the print unions. 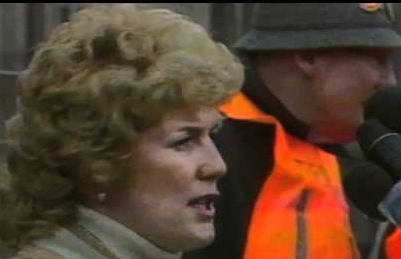 The course of that dispute 26 years ago has been well documented, most famously by Linda Melvern in her book The End of the Street. The world probably doesn't need another version, but as the first Times journalist to work full-time in the plant, I'd like to share my personal diary of the days leading up to the moonlight flit that changed the face of newspaper publishing in this country. June 9 update: Thank you to everyone for the positive response to this post. Please do read through to the comments as there is a fascinating personal account from another sub of his experiences at the time - he was waiting to have an interview for casual shifts just as Charlie Wilson was making his standing-on--the-desk speech. If anyone else has personal recollections, from whatever side of the fence, please do add them or message me. Thanks. We arrived at Liverpool Street, as agreed, on the 12.17 from Colchester. We were then to call a private number to arrange a rendezvous. But we didn't need to go searching for a phone box, for there waiting for us at the end of Platform 12 was David Hopkinson, chief night editor of The Times. He was there as a rather high-powered messenger boy for Charles Wilson, the editor and the person we were about to call. "Charlie's in a meeting and can't get away," Hoppy said. "You're to have lunch on expenses and then call him at 2." We did as bidden, but Charlie was still too busy for us. "Call again in an hour." Again, the meetings were making escape tricky. On the fourth phone call, he sighed and reluctantly told me: "Come to Gray's Inn Road and wait at the corner of Calthorpe Street." We met halfway up the road, his chauffeur pulled up alongside us, we were whisked inside and off we sped east. The cloak-and-dagger stuff had started for us two days earlier, for Wilson it had been going on for more than a year. 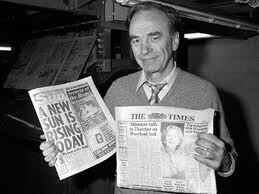 In March 1985, Rupert Murdoch had announced plans to launch a 24-hour paper to be called the London Post. Wilson was to be its editor and it was to be produced from a new plant in Wapping. Over the year a number of key staff had been diverted from their duties on The Sun, News of the World, Times and Sunday Times to help to set up the new paper - though none was apparently based at the new plant. For most of my colleagues on The Times, it was a given that I would be joining them. Why else would a lowly deputy chief sub have been allowed to swan around in Chicago for three months? 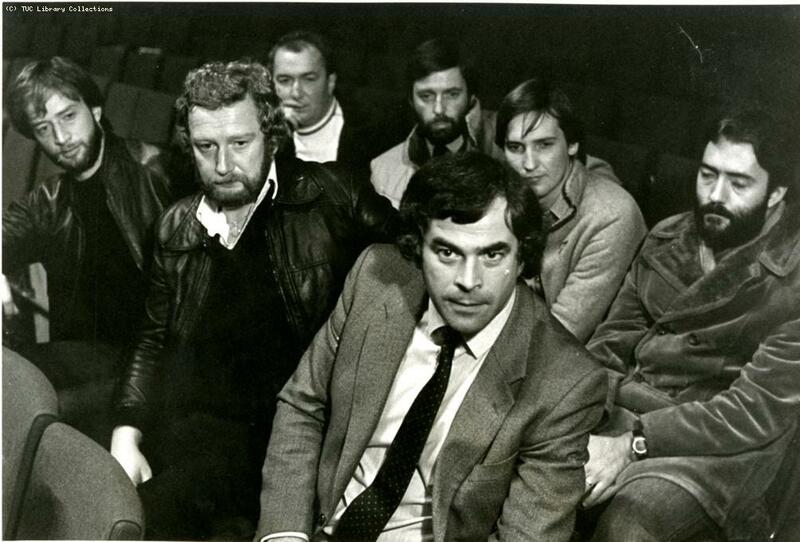 I had been approached by Charlie and Hoppy in February 85 about a journalist exchange experiment. I would go to America and Bob Kirley would come and work on our sports pages. "You must go immediately after the Budget," Charlie - then deputy editor - had told me with that in-your-face urgency he had. I learnt much later that Murdoch had just decided on a "big bang" that would take all his papers to Wapping and that he was in the process of commissioning Atex to set up an editorial computer system. The Atex system was used on the Chicago Sun-Times, where Wilson had had a spell as editor. I knew nothing of that, but by the time I left the country, plans for the Post had been announced. There was no briefing, but common sense dictated that I should learn everything I could about direct input technology. While out there I was joined by Tony Norbury, The Times production supremo, and David Banks, The Sun night editor, both of whom had just been named as key members of the Post staff. We sat up all night talking about the new paper and Banks, who went on to edit the Mirror, spelt out his ideas of how things would work. Even with hindsight, they both appeared completely focused on the Post. By the time I returned to London in the late summer, plans for the Post seemed to be advancing fast, and few expected to see me back at The Times. But back I was. There was a debriefing with Charlie, whose first question was had I been offered a job? "Yes, but it would be wrong to take it," I replied. "After all, if the first exchange candidate deserts, it would spoil it for everyone else." "Kirley's staying here," he replied with a grin. I suggested that it might be fun to go back to Chicago for another six months, which brought the riposte: "That isn't what I have in mind for you." This was in August and I had a long wait to discover what he did have in mind. Norbury and Banks had their stay in Chicago extended and then moved on to Philadelphia, while a succession of senior Times journalists trooped out to Illinois: Michael Hoy, Tim Austin and Richard Williams among them. They had all been named as assistant editors of the Post. In October Charles Douglas-Home, The Times editor, died after a long and extraordinarily bravely borne illness, to be succeeded by Charlie Wilson. Nick Lloyd, editor of the News of the World, was to take over the Post. All the time, the print unions and Rupert Murdoch were adopting more and more provocative tactics over the futures of the News International titles. 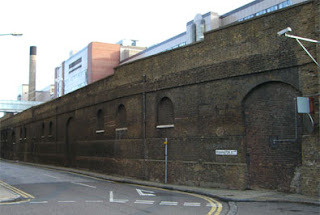 The Wapping plant had been bought in 1982 as a "print shed" - even Murdoch didn't expect journalists to work there. Another printworks at Kinning Park near Glasgow had been refurbished, but lay idle. Talks over these plants had been going on for months and when one round broke down in 1984, an NGA man famously threw a box of matches over the table, shouting at Murdoch: "Why don't you just burn the place down. Don't you understand? We're never going to go there." How right he was. By February 1985 Murdoch was so fed up with what he saw as the unions' high-handedness that he resolved to move all his papers to Wapping, and he started to take an even tougher stance in negotiations. There would be no closed shop and material would be 'directly input' by journalists. Eddie Shah had confronted Tony Dubbins of the NGA, below, over this technology in a vicious dispute in Warrington a couple of years earlier, now Murdoch was ready to do the same. This time there would be much more than a few local papers at stake. The provinces had moved onto paste-up and web offset decades before, Fleet Street was the last bastion of hot metal and restrictive practices - or Spanish customs as the employers would have it. We were still in an era of imaginary workers being signed in as M. Mouse and their wages - at double the national average - were split among the genuine workers. Fathers of the union chapels, rather than newspaper managements, did the hiring (there wasn't much firing) and proprietors had for decades been unable to seize back control. Papers could be halted on a whim. Now the big selling point was that journalists would be able to reclaim their papers; their work could not be sabotaged by wildcat action from irresponsible, overpaid printworkers. At the end of December Murdoch returned from his winter skiing holiday in Aspen, Colorado, and prepared to dedicate himself to the fight for Wapping. He announced that the Post would be launched on March 17 and that he would be transferring production of The Sun and the News of the World to the new plant, even though there was no deal with the printworkers. At the same time the unions decided to hold a strike ballot on a jobs-for-life claim in mid-January. On January 6, a draconian draft house agreement for the Post was revealed. At last, after all the office rumours, I was called into Charlie's office for the conversation I had been expecting for months. But it didn't go the way I had anticipated. Had I wanted to join the Post? The past tense threw me. What did JG - my husband, who had joined the Times foreign subs' desk in November - think of new technology? Was he in the NUJ? Why all this interest in JG? I was the one who had gone to Chicago, I was the long-serving Times sub. "You're going to send him to Wapping," I said. "I want to send you both - on Monday." Nick Lloyd was now getting down to putting his team together. We could go for four months to see the paper through its launch and then return to our Times jobs if we wanted. We then discussed ideas for The Times, which may seem odd in retrospect, but there didn't seem to be anything strange at the time. He was, after all, a relatively new editor. If I had a magic wand, what job would I like? How should the subbing team be reorganised? All minutiae. David Flynn, the executive editor, appeared and loitered for a bit before being told roundly to piss off. The discussion continued. I was dismayed that JG was being brought into the picture, but Wilson was adamant that this was all too secret and that nobody could help themselves when it came to pillow talk. Well, the marriage was not in any state for that to be an issue, but he wasn't to be dissuaded. We had a day to think it through; he wanted an answer by Friday, and if we agreed, he would take us on a tour of the plant. Tomorrow would be my last night at Gray's Inn Road and I was to say nothing to anyone. And so, after two days of domestic arguing and sleepless nights, here we were in a shiny black Daimler for the short hop to Wapping. Charlie was driving, I was in the passenger seat, JG in the back. Charlie talked a bit on his car phone, chatted about Chicago, new technology and insisted that this was going to be a wonderful opportunity. His timing was perfect. As we reached the end of Virginia Street and pulled up at the plant, he looked at me and said: "I want you to go and set up an editorial system for The Times." We were left open-mouthed as he hopped out to get us some passes - such things were unheard of in Gray's Inn Road. He was already wearing a laminated ID card that read 'News International Tower Hamlets Plant Charles Wilson'. 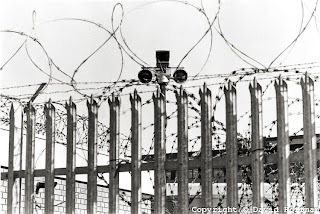 I looked up at the high fences, the huge iron gates, the video cameras and the barriers and gasped. "Oh God. This is going to be another Grunwick." What had we let ourselves in for? Inside the plant, we drove down to the old rum warehouse that was to be home to the Times and the Sunday Times. It was cavernous with huge pipes running along the ceiling; ornate curved brickwork where you felt there should be windows. It looked like a carpet warehouse, stocked with VDUs instead of rugs. Charlie showed us the backbench, picture desk, news desk, and then walked the length of the building pointing out where the reporters, business, sport and features would live. There didn't seem to be room for everyone. At the far end was the editor's office - complete with a ramp for Charlie Douglas-Home's wheelchair. So this had been in detailed planning for very long time. For the first time I wondered if there was ever going to be a London Post. There was certainly no sign of it here. And no sign of Nick Lloyd. I was to work out how the home news should be set up, JG was to focus on foreign subbing. Of course we raised questions about jobs and strike-breaking, but Charlie played that down - and anyway, we were here now. There was no going back. Gray's Inn Road was out of bounds. It was exciting, frightening, earth-shattering. The first day. Tony Norbury was there to greet us and to give us both log-ons. JG was taken off to the Sunday Times building to learn how to use an Atex machine, leaving me alone in the Times office. And I had been duped again. I thought I was going to set up a system, but Tony had already done so. There was a log-on for everyone, a system of copy queues. I was there to test it and see whether it could be made to work. Charlie appeared and made a joke about booking tickets to New York or somewhere. It took me a moment to realise he was likening my tapping at the keyboard to that of a travel agent. Then Murdoch arrived with Tony and asked if we could produce a paper on Day One. He didn't wait for an answer before declaring that we could "with half a dozen subs". The Sunday Times had announced the day before that it was to produce a new section that had been made possible by the new plant. 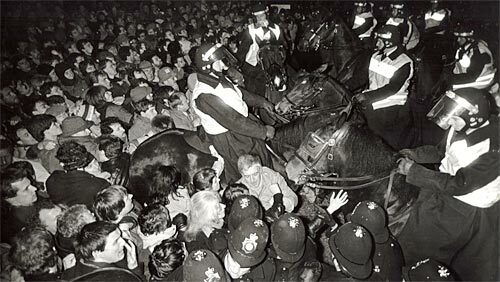 Media watchers were predicting the bloodiest Fleet Street war in 40 years. The battle lines were being drawn: the unions were voting on a strike unaware that Murdoch was marshalling new-tech troops. I felt as though I was being used as cannon fodder and was furious that Charlie had not been more honest. Security men were patrolling the green field inside the huge iron fence, but as the day wore on they were replaced by workers installing the most vicious barbed wire coils I had ever seen. Any doubts that there was violence ahead were dispelled by a trip to the security room where I was to have my photograph taken for the entry pass that was to be carried by everyone in the plant. On the wall was a map of Greater London with pins dotted around it like in the old war-rooms of the black and white films we watched as children. Each one represented a Wapping worker's home, to help the security chief to organise the busing operation. We were apparently to be ferried into work in the provocative armed vehicles used in the miners' strike. Pick-up points with ample parking spaces were to be organised and hourly shuttles run. the pick-up points would vary from day to day to beat saboteurs. Hoppy and Wilson paid brief visits during the afternoon, but I remained the only one concentrating on journalism, struggling with an inadequate PA service. JG was still being trained next door, but apart from the internal message system, he didn't seem to have mastered much. Given a story to sub, he didn't know where to start. God knows what would happen when 18 untrained dozies tried to bring out The Times. Tim Austin appeared to assume his new duties on the Post. He had clearly been fed the same line as we had, and was equally disillusioned when he realised the truth. He had been globe-trotting for nine months in preparation for the new paper - yet he hadn't been taught how to use Atex. Outside, the prospect grew grimmer by the hour. The frightening barbed wire was being double-banked inside the fence and was in evidence all over the site; the roofs were being fireproofed to protect them from possible petrol bombings. I went down into the basement to the composing room and was surprised to find it in full swing. It was staffed by jockeys, plumbers, electricians - anyone who wanted to learn to make up a page. There were dummy pages all over the place, all of which had been copied from back numbers of real papers. The comps were thrilled to have a real journalist giving them fresh material to work on. My first new-tech page was waiting for me when I arrived. It needed three paragraphs cut - compared with the yards of galleys that had to be chopped when subs had to cast off by counting every word. I had hoped for greater accuracy. David Flynn and Colin Webb, the deputy editor, both arrived for an update and wandered off. Arthur Gould, one of two night editors, came for a training session before returning to Gray's Inn Road for his usual ten-hour shift on the backbench. He was the only person allowed to work in both offices. He was to come to Wapping full time the following week on the pretext of taking a short-notice holiday to visit his sick mother in Darlington. We were now being asked to help to prepare the controversial Sunday Times supplement on the future of Fleet Street. There was little point in rebelling. We were heading helter skelter for the great showdown. The morning brought two new arrivals: Mel Webb from sport and my old Chicago exchange partner Bob Kirley. He had been deported in October because his work permit wasn't in order, but now that had been sorted out. How convenient. Mel was distressed about being sold the line of going to the Post only to find himself in an undercover Times operation. He was the first NUJ member to join us and was naturally fearful that he would be booted out of the union. Couldn't there have been a more honest approach, he asked - as we had all done before him. JG said that if my conscience was playing up, I should tackle Wilson. But what was there to say? He was surely as worried for himself and his family - he had a five-month-old baby - as we were. The first Wapping-produced newsprint hit the streets with publication of the Sunday Times special supplement. It included a 12-page feature on the plant, which could, it said ominously, "produce more than one paper". Murdoch was interviewed for the section and insisted that he was not out to get the unions and that there was no dispute with them. "They have refused to work at Wapping, and agreements are in place at our existing plants." There was also an enlightening piece on the clandestine arrangements to get the Atex system imported and installed. Special companies had been set up and all dealings were through Atex's American HQ, leaving its British offshoot in the dark. For once there was no new contingent of Times folk, although I saw Patsy Chapman and her husband Dave Clark arrive for their first day. Dave was an old colleague from Colchester who now worked for the News of the World. Patsy, one of the best subs I've known, had taken over from David Banks as Sun night editor. 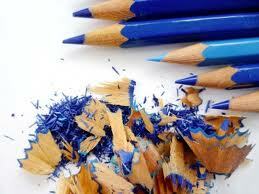 She would go on to become deputy editor and to edit the NoW. 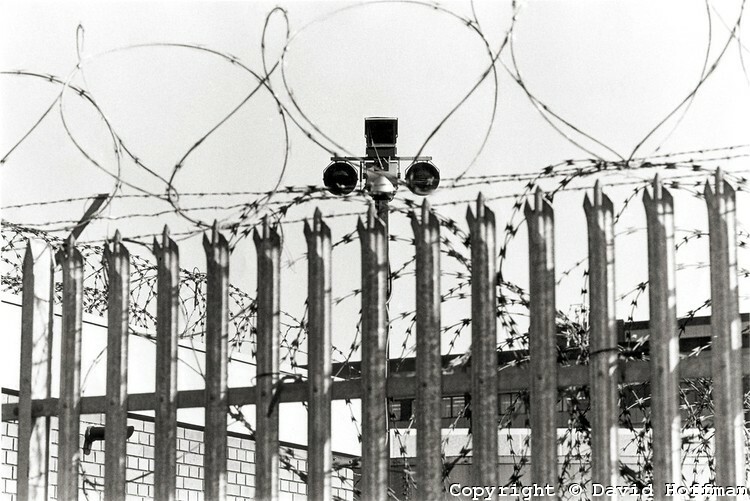 More barbed wire, floodlights and fencing were going up and on Panorama that night Fred Emery, a former Times home editor, coined the phrase Fortress Wapping. Mel Webb was still disconcerted. He hadn't been officially seconded to the Post and he was concerned about the yarn spun to colleagues that he had "personal problems". As far as The Times sports staff were concerned, Bob Kirley wasn't even in the country. He had been contacted in Chicago and secretly brought back by Charlie Wilson, his papers miraculously in order. Downstairs, the comps were willing and friendly. There was none of that "Don't touch the type or we'll all walk out." They had all been recruited from the electricians' union's unemployed list, although none of them was out of work before arriving in Wapping. They mostly came from the Southampton area and had been trained over four months. They were flexible in all composing room jobs, but apparently not the press hall. They had already produced loads of dummy pages and said that one night two million copies of a tabloid had been run off. Certainly there had been rumours of dummy Posts being in circulation the previous autumn. New recruits were arriving at the rate of 16 a week and there were now about 400 on site. At lunchtime I ventured into the new canteen in the big building across the internal road and found Murdoch behind me in the queue for fish and chips. Still more barbed wire was going up. As expected, the print unions voted overwhelmingly for a strike. Brenda Dean of Sogat, above, seemed keen to do a deal separately from the NGA and asked for a meeting, but Murdoch upped the ante with a fresh set of demands. Having been quoted in the ST supplement as saying there was no dispute and that there were agreements in place at the existing plants, he now wanted no-strike deals at Bouverie Street and Gray's Inn Road. The Times chapel met and voted not to go to Wapping, but agreed to cross picket lines to go to work at Gray's Inn Road. In the rum warehouse we were meanwhile told that we were to prepare a "shadow" edition of the paper the next day. A single bobby was on patrol outside the plant. The plan for the shadow paper was aborted, so we continued monitoring the news and half-heartedly producing pretend pages. Wilson turned up on breakfast TV then brought another tour around, including David Tytler, David Blake and Alastair Brett. The unions went to the TUC, which called an emergency meeting for next Tuesday - a strange piece of timins since by then a strike might well have already started. A meeting between the unions and Murdoch was to take place the next day, but only Bouverie Street and Gray's Inn Road were on the agenda. Meanwhile, we were to start preparing the Sunday Times. The lone bobby outside had been replaced by a panda car. Today's tourists included Chris McKane, John Brian, John Mair and Mike Crozier among others. John Brian showed his gentle human nature by going straight up to Arthur - his backbench sparring partner - and saying "Arthur...how's your mother?" Even with the evidence before his eyes, he didn't believe the ailing old lady story was just a ruse. This was the first tour to be told the truth about what was going on. As in previous days, a couple 'fell off' the end and stayed to work in Wapping; this time it was Mair and Crozier. Alan Howe, a former production chief, had reappeared from a sojourn with the Australian, just in time to put his interest in new technology to practical use. Paul Wagner, a former Sun-Times colleague, would be arriving from Chicago the next day. Murdoch met the unions, but they walked out after two hours. Brenda Dean said a strike was almost inevitable and Murdoch described the collapse of talks about Bouverie Street and Gray's Inn Road as a tragedy. The policemen were now in the plant and eating in the canteen. A day of waiting. Murdoch was constantly around, smiling at first, then laying into some poor tired Sunday Times chap who was doing his best to put his paper together - at this point all the 'working' journalists were in the Times office, while the ST building was used for training. the copy for the arts page had gone astray and a house ad had been put in its place. What had happened? Murdoch demanded. Why was the copy late and why hadn't anyone chased it up? "What were you all doing? Having a crap?" he thundered. Later he was overheard on the phone to someone apparently pleading for a secretary's job. "It's too late," he said. "She's got to write a letter of resignation and put it on the desk now. She didn't come out of Sogat..."
I was dashing around trying to help everyone with formatting, Tony Norbury, exhausted after months of secrecy, long days and nights and snatches of sleep on the plant (he and others were to live for months in a Portakabin in the lorry car park), was getting more and more agitated. Wilson brought round another tour - Tony Allaway and a few sports people among them - and, as ever, a couple stayed to learn the new machines. Everyone was tense. At 7pm, the announcement finally came: the printers were on strike. JG took great pleasure in telling the proprietor: "Mr Murdoch, it is now official. Your workers are on strike." He smiled and replied: "That's just what I wanted." In Bouverie Street, Kelvin McKenzie was in bullish form telling Sun journalists that the print unions had no longer got them by the balls. In Gray's Inn Road, Charlie Wilson was making his famous standing-on-the-table-in-his-shirtsleeves speech. He was sorry he had not been able to speak earlier, but the storm had broken. Monday's paper would be written and published at Wapping. "I am here to invite you to come along and help us do it," he said. But this was no invitation, it was a threat: those who did not come would be sacked. The Sun and NoW journalists voted to accept the £2,000 on offer for the switch to Wapping. The Times chapel couldn't decide and agreed to meet the next day. Back at the plant, Arthur, JG and Tim started keying in copy for the Monday Times while I did what I could to help the ST team. At Gray's Inn Road the chapel met at 2 and adjourned after four hours. They were proposing to go to Wapping, but not to use the technology. This did not seem a viable option. There had been a handful of pickets outside in the morning, but news that the NoW and ST were printing at the plant brought out the foundry men and by the time we went home a couple of hundred had gathered. In spite of the rather strange chapel decision yesterday, all the subs turned up at 8am as instructed and went off for their training. Some had not got home the previous night and those who had enjoyed little sleep. There were people in borrowed shirts and ties and usually clean-shaven men sporting stubble. They were as tired as we who had been in the plant for days and nights on end. We'd been bashing away at screens, they had been in endless meetings. And there was still another to go to: that afternoon they all went back and finally voted 'yes' to coming to Wapping. The old Wapping hands now had to put new-found skills into practice. Tim had a little team to do the foreign pages, I did home and helped Arthur with the front; Chris McKane, with next to no training, bravely tackled the intricacies of the court page - and with great success. Murdoch was, of course, in the print hall to push the button to start the presses and to see the first copies come off with great fanfare. The Sun, splashing on itself, looked absolutely fantastic, just like any other day's paper; The Times, which led on Westland, was less so, but we had done it. Whatever the qualms about the people outside and the ethics of the strategy, you could not take away the achievement of that small band. Everyone gathered on the Times backbench: Murdoch, McKenzie, David Banks, Wilson and there was champagne for all. There was no question of driving home, so we went back to the Tower hotel and sat up til 2am watching the Superbowl. It seemed appropriate that the Chicago Bears should win by a mile. Up at 6.40am with an aching head and back to work. Most of the paper's NUJ members reluctantly appeared, bringing with them a new set of problems. We now had to produce a paper with an untrained workforce and none of the pioneering spirit that had kept us going the previous night. The system struggled to cope with a hundred trainees and a similar number trying to get the paper out for real. There were terrible hiccups in getting copy to put in the paper. The reporters were more interested in finding their desks and files and setting up camp than in writing stories; PA was preoccupied with Westland and offering little else. There were problems, too, with phoned copy: the printers were constantly ringing the copytakers and blocking the lines so journalists couldn't get through. Everyone was uncomfortable, scared, guilty about what was happening. Everything was late - and we didn't even get the Wapping story right. We reported that the ST had voted to stay away, when they had, in fact, finally decided to acquiesce. The first big test. The paper was coming together quite nicely, but at 5pm there was no sign of a splash. I happened to look up at the TV and yelled: "I think we have a splash." The space shuttle had exploded just after lift-off, killing all seven crew. It was amazing how everything came together. We ripped out three home pages and created a spread on pages 2 and 3. It doesn't seem much compared with what can be achieved now, but then it was a stunning turnaround. We had papers in our hands within four hours of the shuttle crashing, something that would never have happened in Gray's Inn Road. And page one looked spectacular with its seven-column picture; the best Times front I had ever seen. The new era had begun. The progress of the Wapping dispute has been recorded by so many that my input is unnecessary. Everyone knows about the "white mice" delivery vans, the TNT lorries, the buses, the Saturday night confrontations. It was a horrible time. The unions finally caved in after a year. The strikers received payoffs totalling about £40m, a fraction of what they could have claimed in redundancy a year earlier. By then the plants in Wapping and Kinning Park were producing more than 30m papers a week with a far smaller workforce, lifting News International profits by some 85 per cent. There was, of course, never a London Post. Murdoch later admitted that he had never wanted to publish a London evening paper, but he was quite happy to let the world - and particularly Robert Maxwell, whose London Daily News came and went (with the help of David Flynn) in 1987 - believe that he did. I love newspapers. My shareholders would like me to get rid of them all. Who will win what could be a fight to the death? The people with newspapers in their very souls, or the investors whose interest in printed paper is restricted to the kind with watermarks and £ or $ signs? Some publishers are already preparing to throw in the towel. The Guardian chief executive Andrew Miller said in so many words last year that the print edition’s days were numbered, that digital was the only future. This year he went further, embracing the prospect of giving “citizen journalists” a place in his company’s output. “Socialisation of media is at the heart of our future journalistic calling,” he said. Circulations may be dwindling while web hits increase, but it is an uncomfortable fact for publishers that people like newspapers. Radio was supposed to kill them off. So was television. Then Ceefax and Oracle. Now the internet, the elephant in Leveson’s room. In his evidence this week, Sky’s Adam Boulton said that the elephant was creating competitive pressures that were threatening the viability of the print media. Politicians, for example, were no longer dependent on professional journalists to spread their message – they could now reach the entire public at the click of a mouse. So if basic news could be disseminated without the press as an intermediary, newspapers were left in a desperate search to find something different to offer their readers. Politicians have an axe to grind. It’s very nice for them to reach the public directly; but as battle-scarred as our profession may be, journalists are needed to question, analyse and call them to account. And in any case, how many people are going to click on what some junior minister has to say or follow her on Twitter? Turnout at elections doesn’t suggest a huge engagement with the political process and the MPs’ expenses scandal hasn’t exactly lifted their standing in people’s eyes. The City University professor George Brock suggests that newspapers have to rethink the “bundle”mentality; deal with the idea that people may not want the whole package; accept that they can get their news from other sources and may not want to pay for features or commentary that doesn’t interest them. I can see where he’s coming from, but I think – hope – that he’s wrong. As an old-school hack, it pains me to acknowledge that, other than on the really big occasions such as 9/11, news is not the selling point it once was. It is no longer the main course, but the hors d’oeuvres. The meat of a newspaper lies in its comment section. Features are the pudding and sport the cheese. If people take their news from the TV and internet, where will they get their comment, features and sport? Magazines? 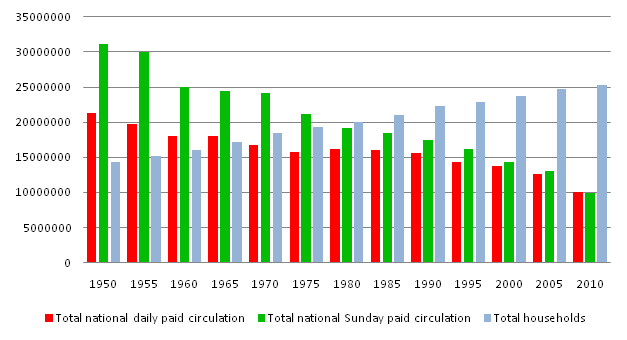 There is evidence to support this theory: newspaper circulations are falling; current affairs magazines are prospering. The Spectator, The Economist, The Week, The Oldie, Private Eye and Prospect are all putting on sales. The Spectator sells 63,000 copies a week; The Economist 210,000; The Week 180,000; The Oldie 41,000. Private Eye a record 228,000 a fortnight. Prospect notches up 32,000 and the New Statesman, which doesn’t submit figures to ABC, about 24,000 a week. That’s a combined circulation of 778,000. Hang on, though. Even in these dark days, nearly 10 million people in Britain buy a newspaper every day, including Sundays. That is something under half the number in 1950, but hardly a sign of terminal decline. We are in danger of becoming so beguiled by trends that we ignore the hard figures. There is still a solid market for print journalism. The big question is how to keep – and develop – it. The first step is to recognise what a precious commodity we have and celebrate and promote it. All newspapers rely on building a relationship with their readers. As George Brock points out in his “bundles” blog, it’s a question of trust. As readers, we think we know where the paper is coming from. That doesn’t mean everyone writing for it has a Stepford brain; the opinion columns of our newspapers offer a range of opinion that you won’t find in the New Statesman or The Spectator. And if we are to retain that trust, we must maintain the quality. But how can we do that when every news organisation is frantically cutting costs while trying to cover every base? Under that approach it is inevitable that quality must suffer. 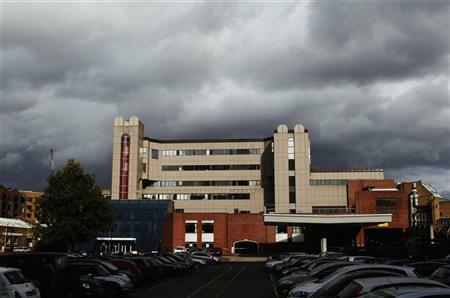 This was highlighted seven years ago by the Sheffield University lecturer Adrian Bingham. His prescient paper for the History & Policy academic group on the future of the popular press pointed to the “tendency to prize speed and short-term impact over accuracy and reliability”. The main thrust of his work was to consider the behaviour of the press and the influence historically exercised by proprietors. This was in 2005, before the News of the World published the Clive Goodman story about Prince William's knee injury that set the whole phone-hacking ball rolling. Bingham concluded that "experience suggests that the press is unlikely to engage in a searching self-examination without some external prompting”. Well it certainly has that now. The Guardian’s Dan Sabbagh tweets constantly from the Leveson hearings, and very entertaining he is, too. Then he has to write a straight news story for the web and the newspaper, plus bits of analysis and colour. It’s madness. How long can you keep up that sort of pace? Reporters have to fulfil so many roles and cover so many stories that they spend their working days on the end of a telephone. They don’t have the time to go out and meet contacts, build stories, follow hunches. Subs are increasingly regarded as surplus to requirements. Across Fleet Street their numbers are being reduced, yet they are expected to push out copy for print, web, mobiles and tablets. You have reporters bashing out stories and tweeting like billyo and subs scrambling against a dozen deadlines. No one is allowed to specialise in any field in which they have a real aptitude. Everyone must function in every sphere. The result? A multi-platform modern media for the digital age? No. We’re giving - or rather selling - our readers half-researched stories and rehashed handouts with literals in headlines, misspellings, bad grammar, wrong pictures and captions that say ‘xxxxx cccc here please’. And so people lose faith in papers and stop buying them - and the decline of print journalism becomes a self-fulfilling prophecy. Newspapers are so intent on promoting their digital content that they are neglecting their reader-friendly traditional format, a format that has served for three centuries. The blogger Fleetstreetfox has a huge online readership, but she wanted a newspaper column. Why? To make more money? To gain a wider audience? To have a “proper” platform for her views? All three, she admits. She now has a weekly spot on the Mirror’s website, but still she yearns to appear in the print edition. Why? Because newspapers are special. For a start, they are tactile. You can’t curl up with a laptop in the same way, tear out a bit to show a friend or, like my neighbour, take it into the bath. Typing in crossword answers or numbers in a Sudoku grid isn't the same as writing them on to a paper version. Readers notice the different qualities of newsprint, the feel of the supplements. A printed newspaper has a special geography and rhythm – and don’t the readers howl when it changes. It helps the reader along. There is a hierarchy. Yes, of course the splash is the most important story, but as you move inside, the sequence of pages, the positioning of stories on spreads, the sidebars, the factboxes, the pictures, the witty bottom nibs, and, most of all, the typography all indicate what the editors think are the most important, interesting, intriguing aspects of the day's events. You don’t get that on the web or iPad. Online you’ll find a main story and a series of puffs and links, but little to indicate which the editors regard as the most relevant or important. There is a constant pressure to update the lead, but it’s hard for the reader to find the story that would make page 7 or 17 in the paper. On the iPad, you may see the same stories as in the print edition, but all the headlines are the same size, every news page is alike. The other day The Times carried a huge file picture of Adele with an armful of Grammies and a small story saying that her 21 album had outsold Michael Jackson’s Thriller. In the paper that would have been a nib, possibly with a picture. But on the iPad it had the same presence as a serious political story. Can that be right? Newspapers don’t have to die; they have to rethink themselves. Dumbing down was the solution of the 1990s. Today we should be wising up. News pages should be more incisive, with more background, analysis and commentary (clearly marked as such) on the main subjects of the day, but also with cross-fertilisation with the web, guiding readers to relevant material published in other media. At the same time, the secondary stories, the quirky and offbeat must be protected. Readers can stomach only so much war, economics and politics; it's the "everyday" stories that don't mean much in themselves but are simply interesting that newspapers do better than any other medium - the stories that don't make it to television or radio bulletins and probably don't get read on the web or iPhone. Court cases are definitely in this category - think of the old-style Telegraph page 3. Features should be original and home-researched, rather than based on whatever book, television programme, film or album is coming out next week. How many interviews with Chris Martin or Daniel Craig does one country need? But originality costs money. Next, we need to accept that the journalists who put a paper together are not representative of the country as a whole. They need to take a wider view. Britain isn’t a nation of yummy mummies, hoodies and grasping immigrants. We have a diverse population, yet our papers don’t reflect it. They are written by thirty and fortysomethings for thirty and fortysomethings and the rest of the world can go hang. If you think I’m exaggerating, look at the preview coverage for the latest series of Mad Men, a television programme that attracts an audience of fewer than 50,000. The received wisdom has always been that young readers are key. The philosophy, rather like that of the banks, has been “catch them young and they’ll be yours for life”. The logic now is that the young can’t be bothered to buy papers, but are digital savvy with their smartphones, Twitter etc, so those are the formats that count. But they still buy celeb mags, don't they? Are we missing a trick by chasing only the young? We have an ageing population: generations that have spent their lives getting their news, puzzles, football reports and recipes in print. Pensioners will soon account for a third of the population. Do they want to read the newspaper on a computer or phone? That’s a heck of a lot people to write off. Then there is Londonitis. The UK has a population of about 62 million, of whom about 8 million live in Greater London. Yet the serious papers virtually ignore the 54 million in what they dismiss as the regions or the provinces. They lump together Manchester, Birmingham and York as though they were a single entity, treat Devizes and Hertford as though they had the same concerns and interests. Who (apart from the Telegraph) cares about people living in the countryside? This is a whole untapped source of readership, but it will become more and more neglected as editorial cuts bite. In the 1980s, The Times style was actually to byline reporters who worked outside London with a “from” dateline as though they were in Outer Mongolia : From Craig Seton in Stafford; From Richard Ford in Belfast. Thank goodness that has at least stopped; and how delicious it is that the paper’s most talented investigative reporter, Andrew Norfolk, operates not in the capital but ooop North. Price is another issue. Royal Mail struggles to convince the public that collecting a letter posted in Hastings at 5.30pm and delivering it in Aberdeen the next morning is exceptional value for 70p. 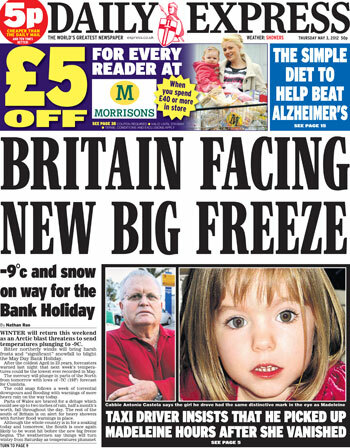 What hope, then, is there of persuading readers to part with £1.20 for a 28-page Monday broadsheet with pictures of Kate Middleton and cute wildlife, a lot of eurogloom and some football? OK, so maybe they buy. But will they do so tomorrow, and the next day? A tenner a week for a daily paper plus bumper weekend editions is quite a chunk out of a stretched household budget, especially if the business or sport or travel supplements are routinely thrown away unread. It doesn't feel like value (even though, of course, it is). The Times price war under Peter Stothard in the 90s laid the myths that AB readers were not price-sensitive and that to reduce the price cheapened the brand. The paper's circulation flourished as it never had before or since. Today The i is doing quite nicely, thank you, at 20p. We are told that the economics don't work for print. Newsprint is expensive, falling circulations hit advertising, which is already suffering because of the state of the general economy. That's all true, but what is missing is the will to succeed. Newspaper owners see digital as the new nirvana and print as something that they have to put up with - for now. The pride in print has all but gone. Just look at the hideous adverts of all shapes and sizes. Ads used to be confined to the corners or across the bottom of pages; now they can sit in the middle, diagonally across spreads and even occupy the top half of the page rather than the bottom. Then there are the pages cut in half vertically and the wrap-arounds that hide the real front page. They all make it so much harder for the reader to find the editorial. No one seems immune: advertisers have got the papers on the ground like a lion with a wounded zebra, and they're gorging themselves. There’s no escaping that papers are losing money. The Guardian group is haemorrhaging £40m a year; it has cut 250 jobs and is heading down the digital highway. Sly Bailey has paid the price for the decline of the Mirror group. The Times has lost money for as long as anyone can remember, but suddenly it is expected to become viable and stand alone. 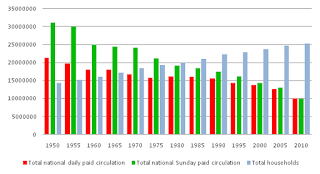 Times and Sunday Times losses have been cut from nearly £90m in 2009 to £45m in 2010 to less than £12m last year. Why, after all these years, is there this imperative for them to pay their way? Because of the shareholders. As Murdoch pointed out in his comment to the Leveson inquiry at the top of this post, News Corp investors, mostly in America, are sick of the nonsense of the newspaper industry and particularly the hacking scandal. They are happy to take the benefits afforded by the TV networks, film studios, blockbusters and satellite and cable, but they are not willing to carry passengers, particularly passengers from another country. It’s too easy to forget that this giant multinational was built on print. Please can we have a press baron? Cost-cutting is not the answer. Throwing everything into digital is not the answer. News organisations need imagination and investment. They need to build on what they know best rather than to throw away decades of experience. Of course they must embrace the new media, but there is still a place for print and to abandon it will prove a huge mistake. Look at the past and you will see a legion of giant beasts of the newspaper world: Hearst, Rothermere, Beaverbrook, Northcliffe, Murdoch, Maxwell. Maybe not people you would want as house guests, but men with vision and passion. Maybe, like football, newspapers need to find a new breed rich men looking for a plaything. The old press barons were as much or more interested in power and influence than in profit. That is off limits for now, so unless you have zillions to squander, it’s the bottom line that counts. So it comes down to the Desmonds and the oligarchs? Not necessarily. 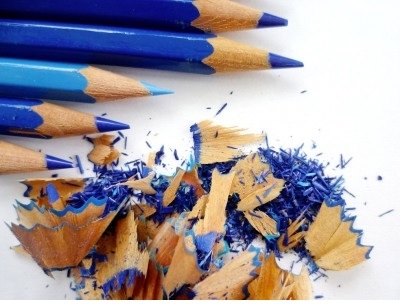 Editors could reassess the packages they produce, look to new readerships, and put forward new strategies. The survival of print journalism lies in the hands of the journalists. When civilian journalists - bloggers to you and me - write a new post, they tend to send the link out on Twitter and hope that people will retweet and share it. If that doesn't work, they can try badgering, bullying, bribery and blackmail - but if the readers don't think it's up to scratch, they won't pass it on. You could call it raw news judgment. Professional journalists pass similar verdicts dozens of times every day. Reporters are bombarded with handouts, emails and phone calls from PR types trying to sell this soap, that survey, and the other view on what some politician said yesterday. Just like the people on Twitter who glance at a link and move on, the reporter needs to be convinced before passing this unsolicited information to a wider public. Most handouts are just sophisticated junk mail, with commensurate news value. For a start, they invariably present the one-sided view of someone with a vested interest or an axe to grind. On busy news days, they'll be cast into the trash, but in quieter times they may win a second look. This weekend, with little more than a rainy bank holiday and some election fallout vying for news space, news editors will pay slightly more attention to the dangers of drinking tonic water, while PRs worth their salt will time their pitches on how to improve the transport system. Since none of this is strictly news, a story's chances of appearing in print will rely on how interesting rather than how important it is. And that, of course, is an entirely subjective judgment. Sadly for the diversity of the press, these judgments are largely made by the same sorts of people. Our national newspaper editors are, with one exception, white men, mostly in their forties and fifties. Backbenches and newsdesks are also still male-dominated, while women continue to be allowed - and I use the word advisedly - their heads predominantly in the features departments. And so, the news agendas have similar threads running across all breeds of paper, a lot of them born of received wisdom rather than genuine belief - a journalistic version of case law, if you like. 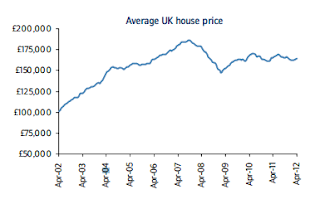 One perennial that should have died off 20 years ago still flowers: the housing market. As with all plants, it blooms more profusely when under stress - in this case when there's little else to fill the paper. 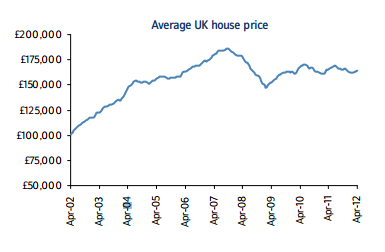 I was rebuked in the 1980s for failing to run a house price index story. "House prices are of abiding interest to all our readers," I was told. That might have been true then, but the surveys seemed meaningless, other than to provide dinner party chat fodder: after all, who lived in the 'average' house? In the 80s and 90s, prices were either soaring or plummeting, and there were real differences day to day, not just month to month, with couples either celebrating huge paper profits and dreaming of luxurious retirement or despairing as their biggest asset shrunk before their eyes. People stopped seeing a house as a place to put down roots and build a family and a life, but as a step on a ladder that led to the rainbow with its pot of gold on the side. That ladder idea still pertains, though these days it has only a couple of rungs leading from living with mum and dad to a modest house via a starter home. The market has been pretty stable - stagnant might be a better word - for years, but the newspapers' obsession remains undiminished. The same goes for interest rates - or rather for mortgage rates; no one gives a stuff about savers. 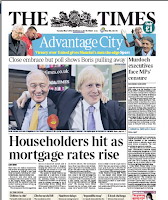 On Tuesday The Times splashed on the news that more than a million homebuyers would see their repayments increase by hundreds of pounds a year because a clutch of lenders, including the Halifax with 850,000 borrowers, were raising their variable rates. This would, the report said, add £55 to the monthly cost of an "average" £200,000 mortgage. There was nothing in this story about what, if anything, was happening to savers' rates - even though there are roughly seven times as many savers as borrowers in this country and millions of pensioners struggling on fixed incomes and dismal annuities. The rates are going up because money is costing more on the wholesale market. It's all about profit - and in the case of the Halifax, getting some dosh back to the taxpayer. Savers continue to receive a paltry 1 or 2% return on their money. You might read a bit about this in the personal finance pages, but rarely does the issue feature on the news pages. After all, news editors tend to be family men trying to make ends meet as the mortgage goes up. And these young men haven't lived through the era of 10, 12 and 15% interest rates; to them, anything above 4% feels like usury. 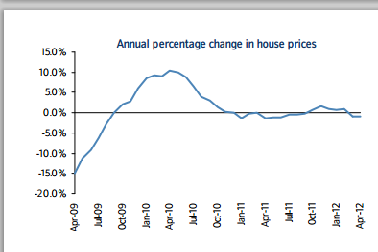 And what's happening to property prices? Well, the Nationwide published its April figures today (above) and the Halifax is due to produce its statistics in the next few days - and they're bound to get big play, it being a quiet news weekend. So was I wrong in the 80s? Do they have value? Judge for yourself from the March figures. The Halifax reported that prices went up 2.2% in March, after a 0.4% fall in February. Prices in the first three months of the year were 0.6% lower than in the same quarter last year. 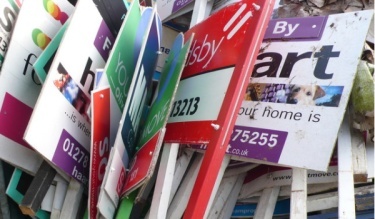 The average house price in March was £163,803. The Nationwide reported that prices went down by 1% in March, after a 0.4% increase in February. First quarter prices were 0.2% up on the same three months of 2011. The average house price was £163,327. The Land Registry reported that prices were down by 0.6% in March after an 0.1% increase in February. The average house price was £160,372. Do you feel wiser for that? 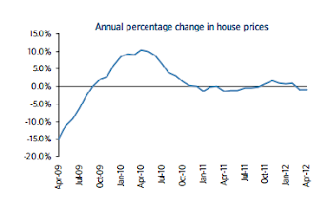 The only vague area of consistency is the average house price. But, as I asked earlier, what is an average house? You are looking at a mean price taking into account castles in Scotland, mews houses in Kensington, semis in Swansea and studio flats in Hull. Yet still newspapers insist on publishing these statistics - although whether they appear as fillers in the business pages or splashes to the entire paper depends on whether there's anything else to fill the space. Of course we have to publish unemployment and inflation statistics monthly. But, come on, these house price figures are just another bit of PR junk mail and they should be treated with the scepticism that would be meted out to any other single-interest survey. The very least we can do is to offer our readers the service of researching a little deeper. For example, doesn't it strike you as interesting that Leah Milner in The Times told us on Tuesday that the "average" loan of £200,000 would cost £55 a month more. An average loan of £200,000? 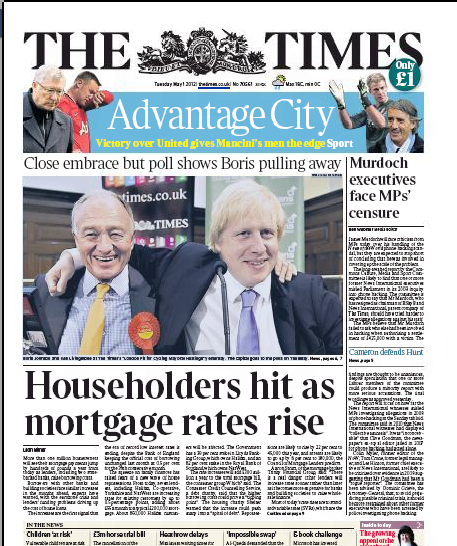 When the average house costs £163,000 - and at a time when banks are reluctant to lend more than 80% of its value? And so to Madeleine. 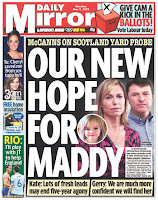 As expected, the McCanns surfaced for the anniversary. And just as no news editor dares shy away from house prices, nor will he risk missing the latest performance from this circus. Let's be clear on this. Just because it's the anniversary, there is no obligation to run a Madeleine story. 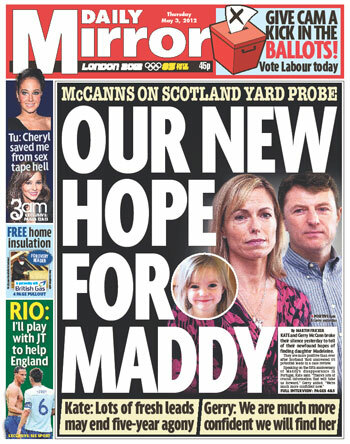 Just because the McCanns speak, there is no obligation to record their every utterance. Just because a television programme broadcasts an interview, there is no obligation to reproduce the transcript in print. But we just can't help ourselves, can we? 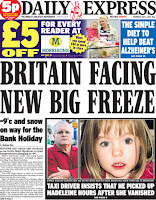 So, of course, we had two papers splashing on the missing child today, while the Express exercised the utmost restraint and contented itself with a front page picture puff. Was there any news? Well, Gerry told Lorraine Kelly's television programme that he had never felt as confident as he did now that the mystery would be solved. And Kate said that the younger twins had vowed to find their big sister. Come again? The twins are seven. They can see how preoccupied their parents are; children of that sort of age are sensitive and eager to please. It's easy to imagine little Sean saying "Don't worry Mummy, if you don't find Madeleine, Amelie and I will keep on looking until we do." Now let's go and play football please. How much store can we set by such promises? In a family dominated by its absent member? Is this not the sort of placatory stuff you'd expect from a child whose life is overshadowed by an older sister he never knew? When my daughter was that age, she invented her own personal rescue service, Horse Help Need. When we discovered on returning from a trip to France that the back of the new car and all its contents were smothered in spilt washing liquid, she rushed into the house. We hoped she had gone to fetch a mop or cloth. But no, she came galloping out in her Horse Help Need hard hat and badge and went charging round the car promising help without doing anything practical, like helping to unload the sodden holdalls. That's what seven-year-olds do. Their pledges on unending quests are to be taken lightly. It wouldn't be a proper anniversary, though, without a 'new lead', and today's offering was a taxi driver who claimed to have had Madeleine and four adults in his cab on the night of the disappearance. Now this is an interesting one. "I'm certain it was her," said Antonio Castela, 72. He had picked up the child, three men and a slim blonde woman from a taxi rank in Monte Gordo - about an hour from Praia da Luz, where the McCanns had been staying - and taken them to an hotel two miles away. There they had got into a waiting blue jeep with foreign number plates and driven off. He was sure it was Madeleine because the little girl was wearing pink Eeyore pyjamas and he noticed the mark in her eye - it was the same as one his son had. Mr Castela had told the police all this at the time, but "I never heard anything from them again. they didn't seem to take me seriously and never questioned me. They simply took down the details and that was it. I'm amazed nobody has ever asked me what I saw that night." Tut, tut. Those hopeless Portuguese police again. Those lazy coppers who weren't chasing the hundreds of sightings reported in the early days of the hunt. 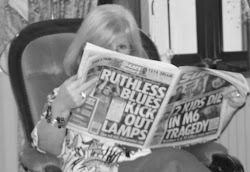 What do the McCanns make of Mr Castela's story? Their spokesman Clarence Mitchell said: "Mr Castela did absolutely the right thing at the time by reporting his sighting. It is clearly deeply shocking that he now tells us he hasn't been interviewed once by a detective in five years." The whole account would doubtless be scrutinised by the new Met review of the case. Shocking indeed. 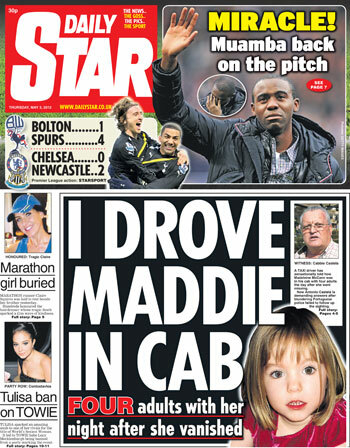 Is this the same taxi-driving Mr Castela who told his story to The Sun in 2008? The same Mr Mitchell who then discounted the evidence "primarily because the timings are entirely wrong"? Yes, the taxi driver story that appeared in the Evening Standard, Express and Star today is almost identical to the one published in The Sun and on the Telegraph and Standard websites four years ago. Then Mr Castelo was quite convinced not only that it was Madeleine sitting on the lap of a rear-seat passenger, "staring straight ahead as though doped", but also that the slim blonde woman was Mrs McCann and that the person in the front passenger seat was Robert Murat - a man whose life was turned upside down as people scattered wild accusations and innuendo willy nilly, with no concern for the consquences. For heaven's sake. When are we going to get real and do some proper journalism or let well alone?